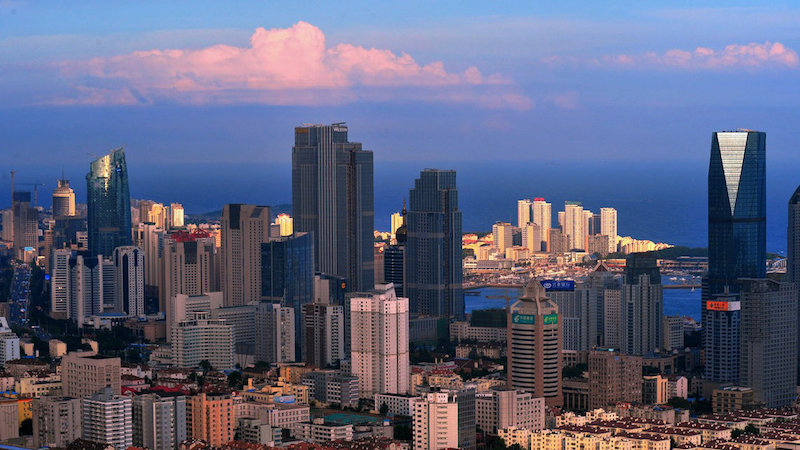 An exciting development for the Qingdao area of China, the new Haitian Center rises from the site of the much loved Haitian Hotel, which is famed for its unsurpassed location and breathtaking sea views. In fact, Archilier Architecture were inspired in their design process by those same uninterrupted views across the sea and by the movement of water. The facades of the four new towers reflect the rolling and undulating rhythms of the ocean. This creative architectural vision will produce an iconic, landmark destination for visitors to the mixed-use development, consisting of a 6-star hotel, a 5-star hotel, a 369 metre Class A office tower with rooftop observation floor, a business club, high-end residential towers, luxury brand retail stores and a major convention centre. CoxGomyl were selected to provide comprehensive facade access systems for three of the towers that make up the Haitian Center and delivering a solution capable of covering one hundred per cent of the facade surface. The project presented a particular challenge in the shape of the continuous and irregular slopes of the water-inspired facades. The total coverage solution involves a range of machines and features, including a total of seven Building Maintenance Units spread across the roofs of the towers. The two smaller towers are both served by a combination of a BMU in a fixed position on the roof and a travelling BMU on a twin track. All of these BMUs provide a 3 stage telescopic jib and elevator mast to deliver the required outreach and flexibility. For the tallest tower, rising 369 metres into the sky, CoxGomyl delivered even greater outreach of up to 50 metres. This part of the access system involves three fixed BMUs, all with a 5 stages telescope jib and elevator mast. In addition to the BMUs themselves being specially selected to provide comprehensive coverage for the curving slopes of the facade, the system is completed with soft rope systems and special restraints which allow horizontal movement of the cradle and ensure the safety of operators. CoxGomyl were selected for this exciting project based on trust in the brand and its reputation as the leading provider of building access systems. The clients saw evidence of how this reputation has been earned at many of China’s most high-profile buildings, particularly the Shanghai World Financial Center.